Reconstruction of the Fort. Consideration for new terms and ideas on the use of this location started in 1971, but was only concluded in 1992, just after the independence of NAMIBIA. A foreign Investor entered into an agreement with government and the Fort was tastefully restored to a comfortable lodge for individual tourists. The reconstructed building shows the former structure. Stables for horses in the northern part of the building was no longer necessary, so they became rooms too. The rebuilding of a MONUMENT is not comparable with the construction of a new Building at all. Nearly all rooms and bathrooms have to be planed and build individually. The use of building materials, characteristic to this area, such as clay walls, stone floors and wooden lining, brings a very special and original atmosphere, with modern facilities. To preserve and maintain such a historic building remains a challenge, so if perfection is missing , please inform management or reception. The Lodge opened in the year 1995. From the beginning, local people were introduced in the business and trained for Tourism and Hospitality. Today we are proud that the descendants of native Damara, Herero and Himba people from the Kaokoveld are hosting you. Remember, this area is in a wilderness area – Shopping of food and beverages needs to go for distances of more than 300 km or even to Windhoek – our guest should be satisfied with excellent service. Information on infrastructure. The FORT is situated near to Sesfontein village which brings some advantages. Security: Namibia is a save country and the lodge is a save place. We assist that, with our own 24-h security service and in short distance, there is a police station. Medical provision: Sesfontein has a medical station and a hospital is in Opuwo, distance of 130 km. Communication: In central areas of the FORT you receive cell phone coverage and the FORT offers you WIFI, when available. GENERAL: For your stay in the Lodge , please note our terms of conditions, laid down at reception, we trust they are accepted. Please notice all articles are property of the Lodge, not for take away and not for sale. Restaurant • Bar • Lounge • Rooms • Laundry • Swimming Pool • Courtyard • Barbecue Fuel Station • Transfers To Airstrip For the latest rates and prices , please click on this page. wine • dine • coffee • relax Breakfast and Dinner in the shade of palm trees, around the pool. Lunch und Snacks during general openings Specials on request BAR The bar is opened from 10.00 am. – 10.00 pm. The bar offers you soft drinks, Beer also draft from barrels, spirits, mixed drink and cocktails as well as a higher wine selection. The prices are laid down in the beverage list. The bar service also looks for the restaurant, the garden and pool area. LOUNGE This area is opposite to the bar, you can take your aperitif there or relax with reading. ROOMS The place gets 22 rooms which are situated mostly around the courtyard .There are single rooms, rooms with two beds , double rooms and family units or suites. Water and electricity 220 V is available for 24 h. Nevertheless we ask our guests to be cautious with this resources. All Rooms are equipped with Air-Condition Hairdryer and Connectors are available at reception. Bed linen and towels will be changed on request daily. Do you have special matters related to your room please let us knew. LAUNDRY For laundry service a stay of two days is obligatory. The reception will give you the prices. POOL The pool has no special opening hours. At dinner-time however it should not be used. The depth is 1.80 m, children and non – swimmer are specially to observe by family or group. Pool – towels are available or can be ordered by the service. For sun beds and umbrellas no reservation can be made. The use of the pool is on own risk. FORT - COURTYARD The courtyard with his palms and acacias is a wonderful place to relax. From your sitting group or from sun beds you can watch the never ending activities of our wever birds. Drinks, snacks and meals you can also take. BARBECUE For special occasion our guests can go for a barbecue evening . Sitting outside you can enjoy the unique southern sky with all the stars and the Southern Cross and that on 350 days a year. FUEL - STATION There is petrol and diesel available at the station. Opening hours are daily from 7.00 am - 6.00 pm. AIRFIELD - TRANSFER Transfer to the landing strip Sesfontein in a round 4 km distance is for our guests foc. 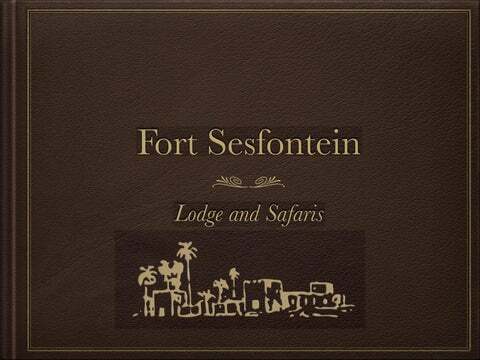 History By staying at Fort Sesfontein, one has to realise that this building is a MONUMENT. The Fort was build in the year 1896 to be a military station of the KAOKOVELD district, established to control the area and give safety. Cattle disease was a major concern, but also smugglers trading from Angola. To protect the wildlife of Kaokoland, especially the poaching of elephants and rhinos, were most important . To assist the local people, Oberleutnant Schulz and 40 soldiers with 25 horses were based at Fort Sesfontein. The local people that live around these areas at those days were around a 130 Topnaar â&#x20AC;&#x201C; Namas, under their captain, Jan Nichamab and also some Herero and Damara families. As nomadic people, similar to hundreds of years before these people spend most of their lives in the undeveloped and lonely endless savannahs and mountains of the Kaokoveld. Reverence is still given by their old rock-engravings. With common support, smuggle and illegal hunting was stopped and so one of the first steps for wildlife and nature conservation in Namibia was born. In 1909 the Fort was handed over to the local police. In the beginning of World War 1, in 1914, the Fort was abandoned and only 3 graves, from soldiers who died naturally, give witness to that old time. Safaris Our Safari division will show you the beauty of the wild, undeveloped and lonely landscapes of Damaraland and Kaokoland. Flat savanna, called vlaktes, wooded mountains and dry riverbeds are the natural living conditions for African wildlife, but also the living circumstances of the local people, like the Himbas , whoâ&#x20AC;&#x2122;s tradition stands fo some hundreds of years. Reference is also given to natives and 1000 years old rock engravings. For our guests we have selected 3 individual activities which form the highlights of this natural African region with authenticity and beauty. If you have not booked your tours in advance you should do it one evening before you want to go at reservation or with the bar service. They all knew the prices and general planing for the tours. We take Min. 4 and max.10 persons on a tour. Tours are operated by our guides in the Fort 4x4 vehicles (game - viewers ). Please be aware that on our tours you get in close contact with wild animals. Attacks are rare but we cannot guarantee that it will not occur. The use of vehicles and equipment of the Fort is on your own risk and we accept no responsibility. All clients are advised to take out comprehensive insurance cover. For safety reasons and for the comfort of others we ask you to refrain from smoking while on the vehicles. On tour we offer you a bush â&#x20AC;&#x201C; lunch and soft drinks, which are included. Should you have special wishes, please let us know. We wish you unforgettable impressions and many memories on your tour. Desert elephants of Kaokoland Free roaming elephants, one of the last places on earth. HOANIB SAFARI TOUR with DESERT ELEPHANTS After a early breakfast you start in a open game-viewer with your local guide and driver to your safari in the dry river beds of North-West Namibia. After a short drive you leave the road and enter the wilderness. At Elephant Song you reach the Hoanib with its green flora of reed, bushes and grass. This is also a place for natural water and keeps wild and predators. We follow the riverbed and it becomes extremely exciting when we reach GANUMUB mouth and pass a port of less than 10m in with. The mostly dry river, all animals and ourselves have to go through the port, but remember : Give Elephants right of way ! Thereafter the river bed becomes larger, with the mountain in the background, growing big trees like, Acacia and the famous Anna-tree. The population of animals gets bigger and after finding tracks of elephants and lions we wish to see them. Wild animals free ranging and in this extraordinary, remote area, is something very special. We spot some giraffes, oryx (the proud weapon of Namibia) more antelopes, ostriches, baboons and zebras. Our picnic will take place under a huge Anna-tree, sitting on chairs around a well prepared table. From the Atlantic in a distance, less than 40 km West, fresh winds blow. Later on we reach Amspot, the westerly point of our safari and the entrance to Skeleton – Coast. For our way back we can choose an alternative. This leads passing the Giribis Vlakte, a huge flat savanna without any trees or bushes, only covered by the yellow Savannah grass. Here we also discover the mysterious Fairy-Circles in the red earth of Africa. Late afternoon, loaded with numerous pictures and unforgettable impressions, we return to Fort Sesfontein and …….Civilisation. DAMARALAND - TOUR with ROCK CARVINGS at SOSOS With this tour we want to introduce you to the live of the inhabitants of Damaraland. We will show you the flora, huge Savannah areas of grass, bushes and plants, like tobacco or in the wilderness Welwitschias. After a trip through the village of Sesfontein with its schools, medical-station, church and police-station, we visit the natural springs. These Fountains which was formed years ago are still used and the springs of Sesfontein still give water to the gardens of the people, prepared hundreds of years ago. The hot springs of ONGONGO waterfalls, forms a natural pool, which invites you to a bath in an unbelievable surrounding. Our open Gameâ&#x20AC;&#x201C;viewer vehicle brings us deeper and deeper into untouched regions, we follow the off road tracks and find the seldom WELWITSCHIA plants and natural wildlife. This area is also home to BLACKâ&#x20AC;&#x201C; RHINO and LIONS. Before we come to SOSOS we take our bush-picnic at a designated area. Refreshed after the picnic, we find Sosos, a temporary fountain and learn who lived here. This was the right place for SAN- People in earlier times for a successful hunt. Did they just spend their time by creating hundreds of carvings of the former wildlife or was this in fact an act of thanking the gods of hunting .Nobody knows what was the need, more than a 1000 years ago, to create this objects. With a lot of impressions and thoughts crossing your mind, we shall go back through the bush-savanna, in the direction of the Hoanib, and drive back to the fort. KAOKOVELD TOUR - with a VISIT to the HIMBAS. Kaokoveld is even today a special region for tourism. The area is open to the public, but we advise to go with a local guide, familiar with the people , area and an equipped vehicle. 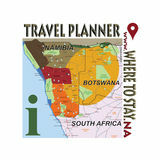 With 50,000 km2 the area is bigger than Switzerland, but only 16,000 people live here, mostly of the tribe of the HIMBAS. There are some chains of high mountains in the region and the now mostly dry rivers are crossing them. The attraction of this area is the originality of the landscape. Together with the fact that this is a very lonely area, it contributes to its beauty. In the mountains there are minerals and also precious stones. The very seldom ocher-powder , the Himbas use as beauty-cream and also take as skin–medicine can be found only at one place in Kaokoveld and that makes it valuable. We will visit that place. Our tour goes from Sesfontein to the north. The pad follows a river bed and we feel the origin of this authentic area. The mountains are covered with large mopane woods. We can imagine the time when elephants and black rhinos lived here. Nowadays the existing animal is the kudu. Köcher-tree, ghost-tree, tamboti and moringa as well as OMUMBORUMBONGA, the holy tree of the Hereros are a welcome alternative to the Camelthorn allover. At last we reach the mine were the HIMBAS get their ocher-stones out and can proof the stone material. We highlight our tour with the visit of a traditional and authentic Himba crawl. Our guide, familiar with the culture of the HIMBAS coordinates the contact with this proud and fascinating tribe. We present our gifts and receive a friendly welcome. With the help of our guide a certain conservation is possible and we become familiar to their culture. On our program the visit of a Depths - mine is the next. We have to go under earth to see where the stones come from. On our picnic we will have a nice panoramic view. In this area is also the famous BAOBAB – trees ,growing for hundreds of years. By measuring one of the biggest trees of 1000 years, one wonders about the stories being told under this trees . While the sun is setting in Kaokoland, we drive back to FORT. See you soon â&#x20AC;¦ at Fort Sesfontein !